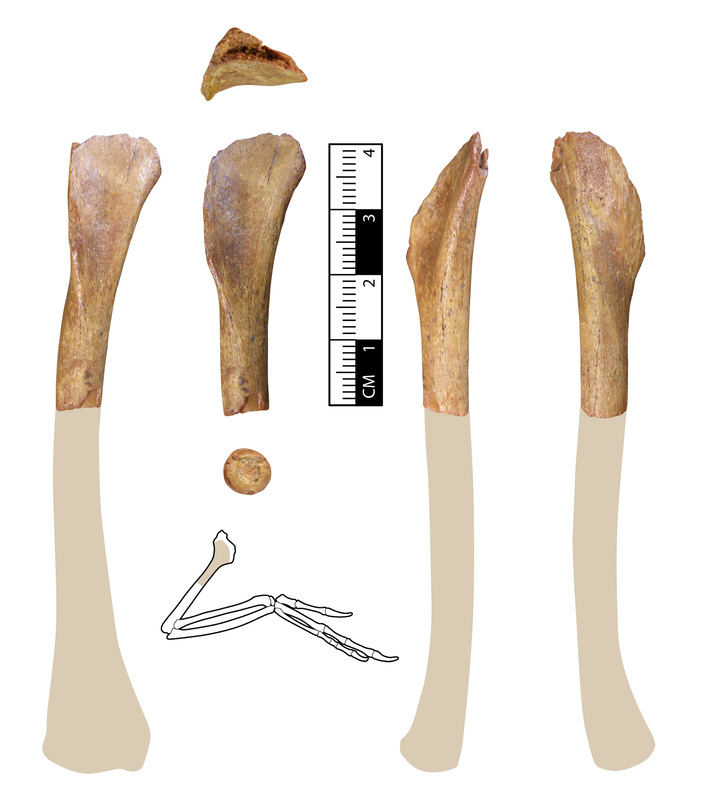 Partial right humerus (upper arm) of an undiscribed Dromaeosaurid. The size is very similar to that of Bambiraptor. This animal was possibly just over a meter long. This is amazing! I am curious, how do you take your photos? on green screen? Thanks. I use my Olympus SP-55OUZ to take the photos. Depending on the size of the fossil I might use a small tripod. And I just lay the fossils on black cardboard with a ruler next to it for scale. I edit out the background in Photoshop. If you don't mind me asking though, what features make you assign this specimen to the Dromaeosauridae? Sure. First of all, the bone is hollow. So it can only be Theropod, bird or Pterosaur. The cortical bone wall is way too thick for Pterosaur, so it cannot be that. Funnily enough, when I first held the bone I knew I had seen the shape before. Since I made a sculpture of a complete Bambiraptor skeleton I had already made the same shape for that. I just had to compare it and the resemblance was striking. Though I wasn't completely sure because I bought it as a composite bone made out of three different bones. So I removed the two other bones and I was left with this piece. then I could see the bone was hollow. I did some more research and the leaf like shape is pretty much identical to many Dromaeosaurids. Those of birds and other Theropods were quite different. So that's how i came to the ID basically. In short it's very similar in both size and shape to the right humerus of Bambiraptor. Though there are some slight differences. Thanks for taking the time to explain your reasoning; that was most helpful. I've done a quick scan of the literature and I see what you mean about the similarities.